Manama, Bahrain: Batelco Bahrain CEO Eng. 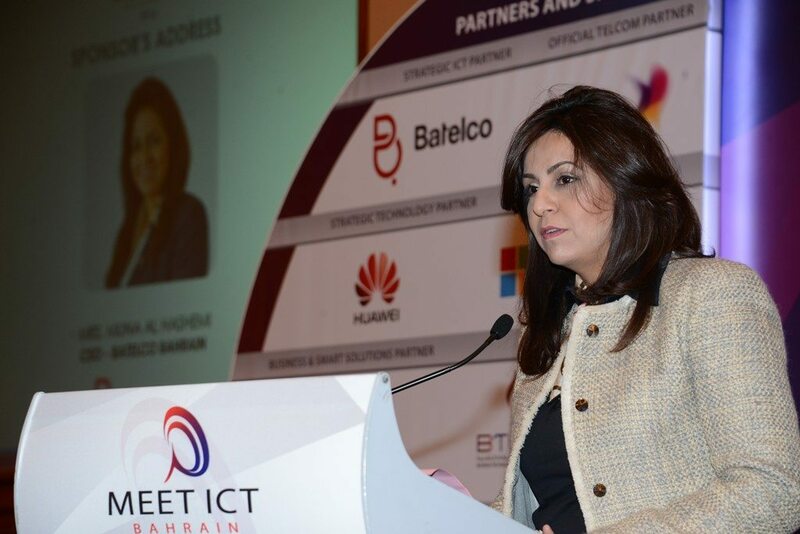 Muna Al Hashemi attended the opening ceremony and addressed the audience at MEET ICT & BITEX 2016 which is taking place at the Gulf Convention Centre from 4 to 6 January under the patronage of Minister of Transport and Communications H.E. Eng. Kamal bin Ahmed Mohammed and organised by BTECH (Bahrain Technology Companies Society) and Worksmart. During the event Batelco has sponsored several technological sessions touching upon ICT, Cloud and security disciplines. Batelco has always been keen on spreading the knowledge to the business society through the numerous conferences and workshops it holds throughout the year. Positive feedback was received following the sessions sponsored by Batelco, encouraging the company to further take on the roll of being the technological leader in the Kingdom and an active thought leader. Batelco, as the exclusive ICT sponsor of the event, implemented the varied connectivity requirements which greatly contributed to the success of the event. MEET ICT is an annual event that attracts all IT and ICT companies to share the latest trends and technologies. It hosts several activities such as workshops, business matching sessions and meetings & exhibits that aim to enhance the experience of the participants and enable them to exchange knowledge and ideas on different platforms. As the innovation driver in Bahrain, Batelco was the first in the Kingdom to launch a series of locally hosted cloud-based services and in addition, Batelco collaborated with industry leaders such as Cisco to offer customers a wider portfolio of Cloud services. All are solidified by Batelco’s widely acclaimed Information and Communication Technology (ICT) services. To suit the organisations’ diverse needs, Batelco offers enterprises the ability to fully customise the specifications for these services. Through its support for this key technology conference and exhibit, Batelco reiterates the alignment of its goals to those of the Kingdom of Bahrain’s and emphasises its support towards the digitisation drive in Bahrain. This press release has been issued by Batelco Corporate Affairs department. Batelco Group is headquartered in the Kingdom of Bahrain and listed on the Bahrain Bourse. Batelco has played a pivotal role in the country’s development as a major communications hub and today is the leading integrated communications’ provider, continuing to lead and shape the local consumer market and the enterprise ICT market. Batelco has been growing overseas via investing in other market-leading fixed and wireless operators.